Oh balls. It’s November. How did that happen? Better late than never, hey? Here’s September’s Cake of the Month – which is a spectacular masterpiece by anyone’s standards. Often cakes for children are very literal; a cartoon character’s face for example (not that there’s anything wrong with that – we are huge fans of Mickey’s grin or Spiderman’s mask). The brief for this cake was Snow White and we love how baker Becca has styled it to the max. 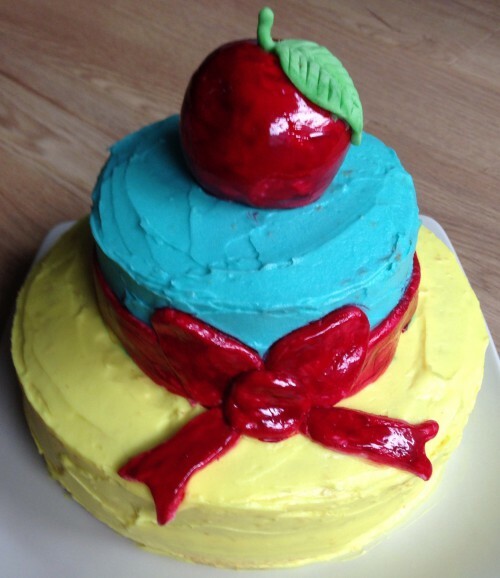 It doesn’t have Snow White’s face on it, but this cake – in colour and symbolisation – is undeniably Snow White. We love it. I made two sponges of different sizes and then sliced them both in half when baked and cooled. I filled each sponge with buttercream and jam and then stacked them so that the smaller sponge sat on top of the larger one. I then covered the cakes in coloured buttercreams and made the apple and bow decoration out of fondant icing which I painted with food colouring. I have always loved baking but as I live with only my boyfriend I don’t like to bake too often (keeping our waistlines in mind!). When I heard about FCFK Hackney I thought it would be a way for me to do some extra baking and it is for such a great cause. I always loved the birthday cakes my mum made for me growing up and think that every child deserves a homemade cake baked with care for their birthday.